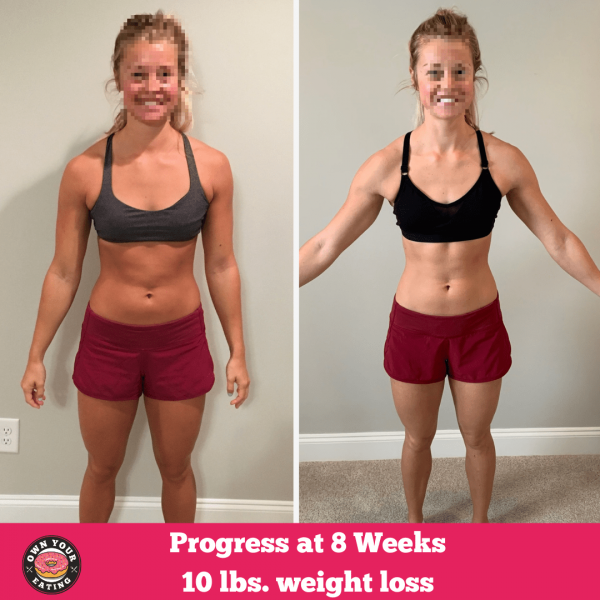 Abby started working with Own Your Eating coach Keirstein in September and has lost 10 lbs. to date! Read on to find out more about Abby’s experience in the last 3 months. 1. When did you start Flexible Eating & how did you get started? I started flexible eating September 17 2018. I bought the lifestyle essential monthly package. 2. What prompted you to get started? I was sick and tired of eating great during the week days and off the wagon on the weekends. And getting no where with how I looked or felt. 3. How much weight have you lost?Only about one inch lost but ten pounds lost! Anything below 135 in the past was good for me. Now anything under 125 is where I want to be and finally manageable! 4. What other changes have you noticed in your body or in general? I am now able to wear all my clothes including the tighter fitting tank tops that I felt self conscious about in the past. Energy feels good. Workouts feeling good! Confidence has increased for sure. 5. What has been your biggest obstacle that you have overcome or are working on? Biggest obstacle still working on- 1. Going out to eat and making sure my numbers are as close as possible. I LOVE going out to eat but I’m OCD about my numbers and hate when they aren’t accurate. 2. When I eat something that puts me over my numbers then I think I can go over board and eat anything in sight. 6. What’s the one thing you previously would have deprived yourself of on a diet that you now get to enjoy guilt-free? I love flexible eating because I am able to enjoy anything I want. I use to hate when I heard people say that, but it’s true! I can enjoy the occasional sweets (Cronuts) and margaritas without having to necessarily feel guilty. I’m very thankful for all the time, pep talks, and information my coach Keirstein provides me anytime I need her! Thank you Jason and Roz for creating such a wonderful program. Find out more about coaches on the Our Team section of our site. Want to learn more about our coaching services? Head on over to the Lifestyle Memberships page and check out the “How it Works” section.